Major Weather Change and A Request - Hi, friend Climate and Weather Information, in this article entitled Major Weather Change and A Request, we have prepared this article well and concise to be easy to understand for you to read and can be taken inside information. hopefully the contents of the post that we write this you can understand and useful. okay, happy reading. Although temperatures only rose into the upper 40s today over western Washington, it felt a bit like spring with the bright sun, light winds, and temperatures in the mid to upper 40s. 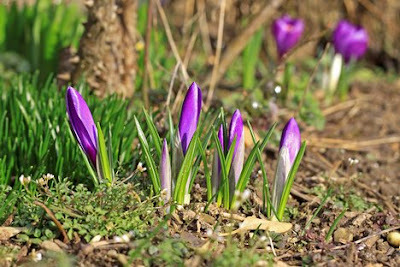 Crocuses are pushing out of the ground, plum trees are flowering, and trees and bushes are heavily budded. The sun is clearly higher in the sky and more intense and the length of day have increased by 1.5 hours over the dark doldrums of late December. Each day we get about 3 minutes and 15 seconds of daylight more. As shown in the temperature plot for the last month (below), the recent clear skies have brought a large diurnal (daily) temperature range, with frost in many areas in the morning. In fact the morning minima have been well below normal the last two days. And we have been dry this month....about 1 inch below normal so far. But this is going to change--more normal conditions are right around the corner. The strong ridge of high pressure over the eastern Pacific system is going to weaken, troughing will develop in it place, a wet period in in store. Sorry. Friday is going to be the last dry day, but with increasing clouds, followed by precipitation overnight into Saturday. Here is the forecast 24h precipitation ending 4 PM Saturday. You could escape the rain that last day by heading to the eastern slopes of the Cascades or southern Oregon, and the rain on the windward side of Vancouver Island and the Coast Mountains of BC will be substantial. Weather Folklore: Wise old meteorologists of our area have noted that the FIRST sign of an incoming weather system is a "cap" on Mt. Rainier and the higher volcanic peaks..the logic being that the upward motion on these mountains will produce the first visible clouds as moisture starts to stream in aloft. Today, you could see it happen...some nice mountain wave clouds on Rainier were apparent this am before moisture started streaming in, made evident by cirrus later in the day. Want to see it yourself?--check out this video from the roof of my building: click here. Some folk wisdom is true. As you know from my past blog, I and others are very worried about the State's adoption of the untested and expensive Common Core math standards. As I noted, these standards are inferior to what we have in place, will be controlled by others, and will cost our state at least 100 million dollars. The Common Core math standards--which have never been evaluated anywhere in the country at this point--will be adopted here if the state legislature does nothing. Right now the only tool to delay this standards is House Bill 1891, which has been submitted by a bi-partisan group of our representatives. This is not about Democrat versus Republican. Now the problem for which your help is needed. The chair of the house education committee, Representative Sharon Santos is not allowing this bill to get a hearing..which would effectively kill it. Not the way things should work in a democracy. Let the bill have a hearing and a vote in the committee. The people of the state deserve better. If you agree, please leave a message for Representative Santos (37th district, near Lake Washington between Capitol Hill and Renton) at the legislative hotline--1.800.562.6000 or email her at santos.sharontomiko@leg.wa.gov Or call her directly: (360) 786-7944 (Olympia) and/or (206) 587-5549(Seattle office). You don't have to be in her district to let her know about our concerns. Thank You and Good article Major Weather Change and A Request this time, hopefully can benefit for you all. see you in other article postings.